Multi-Ball Mount with Tow Hook - - Features three welded trailer balls and a tow hook on a solid shank. Allows for quick switching between trailer ball sizes. Tow hook perfect for vehicle recovery towing applications Mounts on trailer hitches with a 2" x 2" receiver tube opening. Fits 1-7/8", 2" or 2-5/16" couplers. Tow hook limited to trailer hitch capacity. Permanently attached trailer balls cannot be loosened or stolen. Shank constructed from solid steel for optimum strength. Shank protected by a durable powder coat finish. 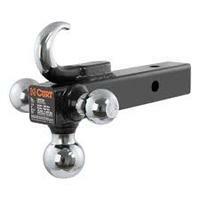 Trailer balls and hook feature a polished chrome-plated finish.